Arsenal seems to have shaken off the recent shambles as they scripted a sensational 2-0 victory against their London rivals Chelsea on Saturday evening. The Emirates tie has now restored their ‘top four’ hopes, but the Gunners must plan for the future and rope in new names to rebuild the squad. As per reports from TMW, Arsenal have joined Napoli in the chase for Mexican attacker Hirving Lozano who has been on the radar of many big guns of Europe following an exquisite World Cup 2018 campaign. Although the forward opted to continue his progress with PSV in Eredivisie, the youngster is tipped to make a move soon to mark his name in Europe. Lozano, 23, is rated as one of the brightest prospects of world football and his remarkable scoring record for the Dutch outfit denotes his growth over the past couple of years. He completed a summer switch to Eindhoven from boyhood side Pachuca back in summer 2017 and made an immediate impact netting 19 goals across all competitions. His influence led PSV to win the Eredivisie crown, and the player picked up where he left off last season having notched up 15 goals so far this term in 27 outings. Lozano has a strong right foot and prefers to operate from the left-hand side of a 4-2-3-1 or 4-3-3 set-up. He is quick, holds strong dribbling traits, loves to cut inside and shoot from in and around the box. His crosses have produced a decent return, and the ability to feature on either flank as well as in a ‘number 10’ adds versatility to his game. 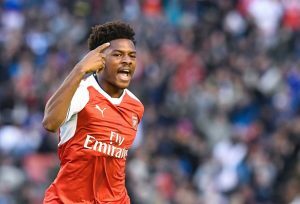 Arsenal, meanwhile, are lacking an outright winger except for Alex Iwobi. Mesut Ozil is struggling to make it in Unai Emery’s system, and the club are ready to listen to offers for the decorated German as per reports. Lozano, unlike Ozil, offers defensive work rate too which would subsequently make him a natural fit to the new-looked Gunners side. Tuttomercatoweb claims that a fee of around £27m with add-ons will be enough to secure his signing in the summer and the North London giants, although having no fund to cash in on this month, must prepare an ambitious bid in the summer to acquire the youngster. Lozano has everything in his game to flourish in the Premier League barring the disciplinary records that might hold him back from fulfilling his potential. He picked up five red cards with Pachuca, one with the Mexico U23s and also received two marching orders in his maiden campaign with PSV. But his qualities are astounding, and he should emerge as an attacking sensation in the upcoming years. Manchester City Set To Vie With Chelsea & Man United For Crystal Palace Ace: Is He Worth The Fuss?